This is a post I've been working on for awhile, mostly because at this point I've accrued such a large chunk of the line. 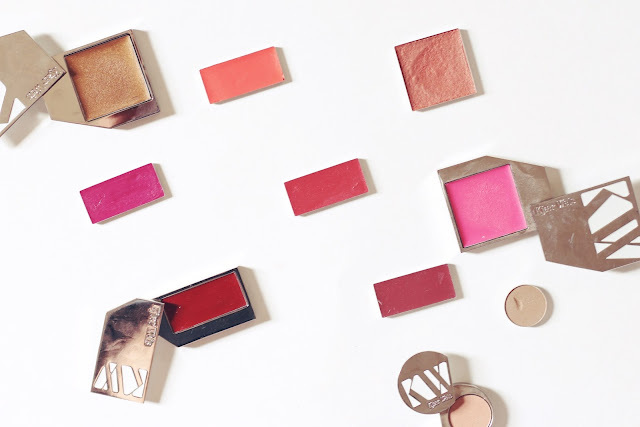 But the thing is, everything that Kjaer Weis makes is gold - truly, her collection of makeup is some of the most beautiful in not only the green beauty market but within the beauty industry as a whole. While my collection of her products continues to glow, I wanted to tell you all a little bit more about my collection of her products that have all become part of my daily makeup rotation. The newest product of the bunch just launched last month, her beautiful bronzer in Dazzling. This gem is both a bronzer and contour cream in one, an adds a gorgeous touch of a bronze glow to your skin. The formula is natural and mostly organic, containing ingredients such as sweet almond oil, jojoba oil and beeswax. While I haven't used it for contouring yet (a practice I've never quite mastered) I can happily say that the formula is perfect for adding a little color to the high points of your face, giving you a very natural looking glow. The bronzer formula is actually quite similar to the brand's cream blush, which I currently own in the shades Happy* and Desired Glow. Happy is a bright, pigmented pink (can also be worn on lips) while Desired Glow gives a "subtle, sun kissed glow" that can actually double up as a bronzer. I love wearing this one because it really does give just the perfect flush of color to my cheeks, making my very pale skin look like it has, in fact, been exposed to the sun before. The formula for both includes ingredients like castor seed oil, jojoba oil and Gardenia Florida Fruit Extracts (a natural preservative that can be found in many Kjaer Weis products). I love applying this creamy formula using a Real Techniques and just gently patting it into the apples of my cheeks, however it can also be easily applied using your fingers. Right now I have two eye shadows from the collection, Magnetic* and Charmed*. Magnetic is a beautiful modern gold, an almost brownish golden shade that can be worn both day and night. Charmed is a stunning neutral taupe color that has become my go-to for everyday. It adds the perfect beige color to define your eyes without looking overpowering during the day. All of the eyeshadows include ingredients such as bamboo, Honeysuckle Extract and Gardenia Florida Fruit Extracts which help to make this flawless formula. As for her lip products, I've accrued quite the collection of these lip tints over the past few months, and a major reason for that is that the beautiful formula is just so simple to apply, with our without a lip brush. With ingredients like jojoba oil, rosa rubiginosa seed oil, beeswax and Gardenia Florida Fruit Extract the formula is not only incredibly pigmented but hydrating as well. All the shades I have can either be applied sheer or built up for more color, with moisturizing properties and long lasting staying power. Rapture* is one of the newer additions for the line, and it might just be my favorite. In the tin it looks like a seriously bright magenta pink, but when applied it adds just the most beautiful wash of color that warms up your face with its gorgeous color. Lover's Choice* is the perfect everyday red, while Sensuous Plum is a wonderful berry color that I know I'm going to love wearing this Fall. Passionate is another berry that can be sheered out to make for a beautiful everyday berry that just about anyone can rock. Then there's Sweetness, a classic coral color that has been perfect for any events this summer. I find this shade to be the perfect balance of orange and pink tones that it can really suit any skin type, adding just the right amount of color without ever feeling like I look washed out from it. Finally, I've gotta talk a bit about the stunning packaging for all these bad boys. Kjaer Weis is a unique brand in that it offers your products both in a beautiful slide-top metal container and also in a less expensive "refill" that you can switch in and out of your container. Since everything comes with a magnetic bottom, you also have the option to store any refills in a Z-palette, an option I've taken up as my collection of Kjaer Weis continues to grow. Right now I own a medium sized Z-palette and am storing a blush, an eyeshadow and four lip tints while still having plenty of room to spare. Have you guys tried anything from Kjaer Weis? I honestly cannot get enough of her beautiful line, and would love to hear any recommendations for products/shades you love!